Hi (or should I say wuff! ), I’m Lola. I am proud to say that I’ve been chosen to be the official ‘mascot’ for Human-Nature Escapes CIC – and on Human-Nature‘s launch day I was formally appointed as ‘head of wellbeing’ (well, top dog anyway). Now I know you’re thinking this sounds a bit silly, and I know you know it’s not really me talking, but just bear with me, there is some sensible logic behind why I have been chosen to be a mascot for the new venture. Born into this world with the colours of a Port Vale fan, just like a leopard, I can never change my spots. 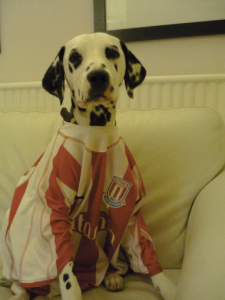 As my photo suggests, on occasions I don the ‘red and white stripes’ of a Stoke shirt, just to please my family and, as I’m actually from Newcastle anyway, my loyalties will always lie somewhere in between. I do like my rather dotty coat, it’s quite distinctive and certainly gets me ‘spotted’. 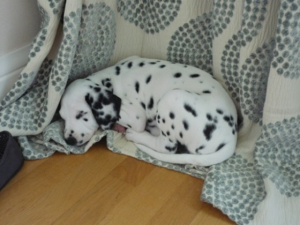 As with all Dalmatian’s, my spots are quite unique to me, with no one else ever wearing quite the same outfit – and, as long as a steer clear of that Cruella, no one ever will! In many respects I did help to found this organisation. Yes, as a puppy, it was actually me who took the lead, and, during my owner’s low periods, I got him out there enjoying the benefits of walking in green spaces and escaping into the landscape. It’s a love we still share today. 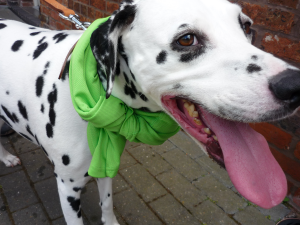 We all know that using me as a mascot is a bit gimmicky – but if Labrador Retriever puppies can be used to sell toilet rolls, then why shouldn’t I as a proud Dalmatian be used to promote the health and wellbeing benefits of green spaces? And just to show that I’m not going to be outdone by those pesky Labradors, here’s a pic of me in my younger days – wasn’t I a cutie! (Although I like to think that I still am).